The first observations of Mars' upper atmosphere made by NASA's MAVEN probe, which reached the Red Planet on Sept. 21, 2014. NASA's MAVEN spacecraft isn't wasting any time at Mars. MAVEN sent home its first images of Mars' upper atmosphere early Monday morning (Sept. 22), just eight hours after entering orbit around the Red Planet. The false-color images, which NASA released Wednesday (Sept. 24), were captured by MAVEN's Imaging Ultraviolet Spectrograph instrument when the probe was 22,680 miles (36,500 kilometers) above the surface of Mars, agency officials said. "Blue shows the ultraviolet light from the sun scattered from atomic hydrogen gas in an extended cloud that goes to thousands of kilometers above the planet’s surface," NASA officials wrote in an online description of the image. "Green shows a different wavelength of ultraviolet light that is primarily sunlight reflected off of atomic oxygen, showing the smaller oxygen cloud," they added. 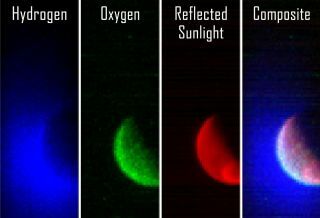 "Red shows ultraviolet sunlight reflected from the planet’s surface; the bright spot in the lower right is light reflected either from polar ice or clouds." MAVEN's observations should shed light on how and why Mars transitioned from a warm and wet world billions of years ago to the cold, dry planet we know today, mission scientists have said. The spacecraft is now in a commissioning phase, during which mission team members will lower MAVEN to its final orbit and check out its science gear. The probe's one-year science mission is scheduled to start in early November. MAVEN isn't the only new arrival at Mars. On Tuesday night (Sept. 23), just two days after MAVEN's orbital insertion, India's first-ever Red Planet effort, the $74 million Mars Orbiter Mission, was captured by the planet's gravity as well.